The UK’s people, places and businesses will only achieve their potential if there is a complete overhaul of how the government views industrial strategy. This is a key message of the Final Report of the Industrial Strategy Commission which has been published today. The Commission, a joint inquiry by SPERI and Policy@Manchester, was established to help to shape the development of a new, long-term industrial strategy for the UK. It launched in March 2017 and has been chaired by Dame Kate Barker. Dr Craig Berry, Deputy Director of SPERI, and Professor Richard Jones, SPERI Associate Fellow and Professor of Physics, are members of the Commission team. Tom Hunt, Policy Research Officer at SPERI, has managed the Commission’s work. The Commission’s Final Report makes a series of recommendations for UK policymakers. It calls for industrial strategy to be rethought as a broad, long-term and non-partisan commitment to strategic management of the economy, and says the new industrial strategy must be an ambitious long-term plan with a positive vision for the UK. The new strategy should commit to providing Universal Basic Infrastructure. All citizens in all places should be served by a good standard of physical infrastructure and have access to high quality and universal health and education services. Health and social care must be central to the new industrial strategy. As well as offering potential for productivity gains and new markets, achieving better outcomes for people’s wellbeing must be placed at the centre of the strategy. The new strategy should be organised around meeting the long-term strategic goals of the state. These include decarbonisation of the economy, investing in infrastructure and increasing export capacity. Innovation policy should focus on using the state’s purchasing power to create new markets and drive demand for innovation in areas such as healthcare and low carbon energy. A new powerful industrial strategy division should be established in the Treasury to ensure the new strategy is driven from the centre and embedded across government. “Industrial strategy isn’t just about supporting a small number of sectors. It should focus on big strategic challenges like decarbonisation and population ageing – and ultimately it should aim to make material differences to people’s everyday lives. This will mean rethinking how government makes policies and chooses its investments. “The UK’s people, places and industries have great strengths and untapped potential, but we must accept the reality that the economy also contains many long-established weaknesses. The Commission will present its recommendations today (Wednesday 1 November) at a launch event, hosted and chaired by the Resolution Foundation. Greg Clark, Secretary of State for Business, Energy and Industrial Strategy will make a keynote speech at the launch. “Our modern industrial strategy has an ambitious long-term vision for the UK that will build on our strengths as a country and deliver a high-skilled economy for the years ahead. 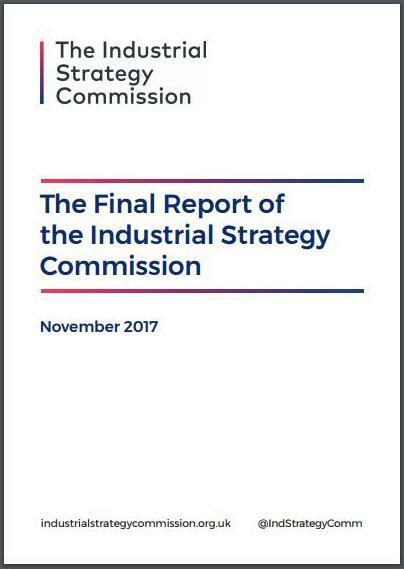 It is encouraging to see the Commission places equal value on an industrial strategy that boosts earning power, spreads prosperity and increases opportunities for all areas of the UK.